Velvet has got to be one of the most common ailments to affect Bettas. And, it can quickly move through a fish room and infect every fish before you know your fish are even sick. Early discovery and treatment is key to successful treatment and fish recovery. This disease is also known as Rust or Gold Dust disease and it is caused by one of several species of a tiny parasite known as Piscinoodinium . Oodinium is a dinoflagellate, a single-celled organism that appears as a pear-shaped golden-brown cell, 125-130 micrometers in length. It is covered by cilia and has two flagella, one of which is much longer than the other. Inside, there is a nucleus, about 12 micrometers in diameter. Flagella and celia propel the parasite through the water. The parasite finds a fish and adheres using the flagella. The life cycle of this parasite can be broken into four stages. The cycle can be completed in 10–14 days at 73–77°F but lower temperatures will slow that cycle down. The first stage is the feeding stage. The dinoflagellate parasite attaches to fish, then becomes a cyst, which penetrate the skin, blood as well as the soft tissue of the gills. The cysts proceed to destroy cells and feed on the nutrients inside. It grows under the skin until it leaves its host. Infecting the gills is one of the things that make Velvet different than a similar disease called Ick. This cyst stage is highly resistant to chemical treatment. It is not unusual to need several applications of a treatment to completely eliminate the parasite. When the mature parasite leaves the host into the water, it enters the second stage. Once it drops to the bottom of the aquarium or into plants the third stage begins where it enters reproduction. The parasite forms a cyst at t his point too, that enables it to survive adverse conditions. This stage is also very resistant to chemical treatment. The cyst actually divides and forms between 34 and 64 new cells where upon the membrane bursts freeing the cells into the aquarium and entering the fourth stage. During this fourth stage the free-swimming organisms are called a dinospore. A dinospore has two flagella, one of which is covered by a body fold and has a reddish eye. Cilia and flagella propel a dinaspore through the water. 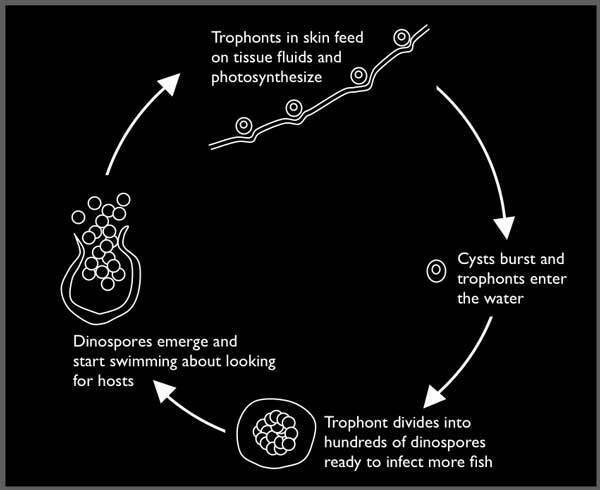 The dinospores swim about seeking a host and will try to attach to a fish within 70 hours – this is the infectious and treatable stage. They must find a host within 24 hours, or die. Once on a host, dinospores burrow into the epithelial layer of the skin and fins and the life cycles begins all over again. Piscinoodinium parasites are partly photosynthetic. The organism contains chlorophyll which gives the parasite its typical gold or rust color and enables it to produce its own food. So while they do derive some nutrition from their host aquarium fish, they also need light to survive. Fish are weakened by the damage the freshwater velvet parasites cause to the skin when they burst, because it allows secondary infections to develop and reduces the ability of your fish to maintain a proper balance of salts and water in the body, causing osmotic stress. To see Velvet on fish you have to look real hard and close, and often a flash light will help you see it. Velvet gets the name Gold Dust Disease because fish with Velvet look like they are coated in a very fine sugar looking powder, that under the flash light, will have a gold color. Fins are also clamped, usually the first sign you will see, and appear almost glued and stiff. Because the parasite also gets into the gills, you often will see heavier breathing. In a effort to rid themselves of the parasite many fish will “flash” or glance off objects to dislodged them. As a breeder you might catch the disease until they stop eating. It is worth noting that sick fish do not lose appetite until their death. Parasites that damage the epithelial layer of the skin and fins cause excessive mucous production and disrupt gas exchange in the skin. This can be very dangerous for young fry whose gill apparatus is not yet well-developed and oxygen enrichment of blood is carried out mainly though the skin. Oödinium is always present in small numbers in water systems and healthy fish resist a major attack. But stress like shipping, poor water quality and temperatures that vary or get cool are prime stressors that seem to bring on the disease in Bettas. Affected fish often go off food and die. It tends to be more a problem to young fish as well. Since Bettas are prone to this parasite, you need to always be on the lookout for it. If caught early it is very easy to cure. But, if it gets to advanced stages you may not be able to save the fish. Because Velvet is highly contagious and usually far advanced before being diagnosed, it is important to take steps to treat it as soon as possible. Treatment is targeted at the free-swimming stage of the parasite because the other stages are resistant to medication. It should also kill the parasites which have infested the outer layer of the skin and fins, but will fail to eradicate any parasites that have burrowed into the epithelial layer. The best time to attack velvet is when the parasite leaves the fish, so raising the temperature helps. That is why it is recommended to create conditions optimal for the parasites’ growth and multiplication and at the same time use the treatment aimed at dealing with them. If you prolong the course of treatment by prolonging the time when medication is administered, you risk poisoning the fish. Sick fish can be treated either in a separate hospital tank, in a main tank or barrack system or since we are talking about Bettas, beanies. Things to consider are plants, snails and biological filtration. If you are treating a filtered tank or barrack system, discontinue carbon filtration during treatment. Be aware that many of these medicines can damage other plants and invertebrates that may be living in your tank as well as destroy biological filtration. Controls diseases caused by external fungi and parasites on fishes. Contains zinc-free, chloride salt of malachite green. Use 1 teaspoon per 10 gallons of marine or freshwater. 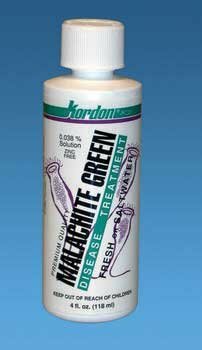 Use this with caution as Malachite Green is toxic… poisoning your fish, the “good guy” bacteria populations in your system, as well as and hopefully, to a lesser extent, the Velvet you want to be rid of. To take care not to spill or splash because this stuff WILL stain blueish and is a pain to get stains out of clothing, skin and especially aquarium silicone. Malachite Green should be utilized in a separate treatment tank as it is quickly absorbed by detritus, natural gravels and most all plastics. Copper is the treatment of choice. But use care, copper is a toxin and can poison and kill a fish if over dosed. Products like Aquarisol by Aquarium Products and Copper Safe by Mardel are easy to get at local fish shops and handy to keep on hand. 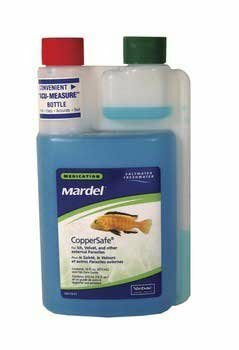 CopperSafe is a unique stabilized form of chelated copper that is designed to maintain a therapeutic level of copper that is safe for fish but effective against parasites. It is affected by hardness; use with caution, can be toxic to fish and inverts. Aquarisol Dosage on the bottle is 1 ml treats 18 gallons . I have used 1 drop of Aquarisol per beanie to treat Velvet and I often add 1 drop to a gallon of water when shipping to keep Velvet at bay. Do not use on invertebrate. i like to use this as a SANITARY NET DIP. Use one teaspoon per 10 gallons of water. This is also affected by hardness so care must be used as it can be toxic to fish and inverts. In case you missed it, copper meds will kill invertebrates. Plus, they can be difficult to remove from a tank. Copper can be absorbed by the silicone and gravel and other porous stuff in a tank, and it will continue to leach back out over time, even after you’ve changed all the water and are running carbon. So, this is definitely a med for QT only. This is a messy med. I stains everything it touches yellow and I find it a pain to work with. General consensus on the internet is it can cause infertility issues in fish and my results using the medicine support that. If used make sure treatment in a glass hospital container that can be bleached when done. Use in tanks and with beanies or plexi barracks will give you stains that can not be removed. It can be used at 1 ml Acriflavine (trypaflavine) per litre aquarium water. Because aquarium fish can acquire some degree of immunity to Piscinoodinium, healthy aquarium fish may fend off freshwater velvet disease for years without any help from the aquarist. But this also means that anything that weakens the immune system of the aquarium fish can allow velvet disease to suddenly appear in aquaria despite the absence of newly added aquarium livestock. Bullying, poor water quality, the wrong water chemistry, inappropriate water temperature and the wrong diet can all reduce the immune response of aquarium fish, and in turn make problems with freshwater velvet disease more likely. Copper. It should be used according to the manufacturer’s instructions for a full ten days to ensure that the parasite is completely eradicated. Atabrine (Quinacrine hydrochloride) is another medication that can be used to treat Velvet. Because Oödinium is dependant on light, dimming the aquarium lights aids in eliminating the infestation. 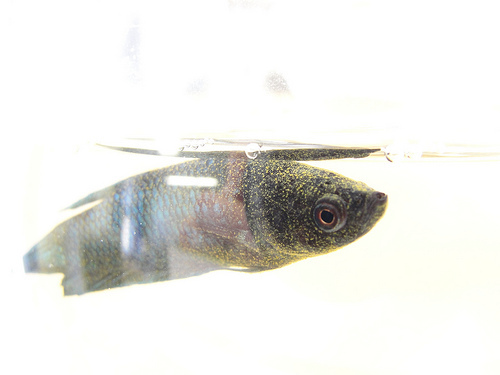 Increasing the water temperature to 82°F will speed the process, and adding salt to the water will ease the labored breathing caused by destruction of gill tissue. As with any treatment, activated carbon should be removed from the filter, as it will remove the drugs from the water. The photo of the fish with Velvet comes from a post by TheLittleMiss . A special thanks for allowing us to use it. This article in particular from the University of Florida Tropical Aquaculture Laboratory deals with the disease.